4:30 in the morning and started to approach the pass. Again we started in sleet and snow. But today it was not for long as soon daylight was breaking and the clouds started settling down in the valley like vampires that are scared of sunlight. Eitan was again looking for good landscapes to capture in the dawn. 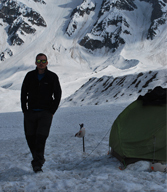 Mountaineering is all about altitude and Himalayas are the only mountains which can provide you altitude. The highest mountain training playground.This mountaineering course is a demanding / challenging expedition. In this course you not only learn tecniques but Himalayn altitude also gives you an authentic classroom to train youself best. Here are some training pictures with tags of highest playground on earth. Rock climbing often tests a climber's strength, endurance, agility and balance along with mental control. As climbing routes or problems increase in difficulty, climbers learn to develop skills that help them complete the climbs clean. There are several techniques for hands and feet as well as terms for motions that combine the two. Ascent Descent Adventures offers Rock Climbing course for seven days for devolping skills with relative ease. Like you, my first brush with geometry and the Pythagoras theorem was during school days While I struggled then, in my adulthood I realized the magical beauty of some of the shapes when I saw them in the real world. 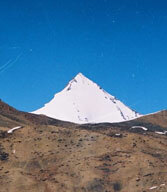 One of them was the triangle created by nature in Spiti. This rainy reason (end-June to end-August) I urge you to visit this region in Himachal Pradesh. Ascent Descent Adventures is India's first company which provides mountaineering courses in Indian Himalayas under the guidance of certified instructors. 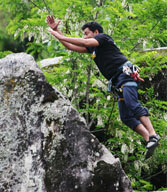 We specialize in trekking, climbing, rock climbing, mountaineering, hiking and river rafting. We offer personalized itineraries, treks, family trips, school trips and corporate trips. Copyright © Ascent Descent Adventures. 2013. All Right Reserved.